I’m doing well with my 2014 to go list – 2 weeks in to the New Year and I have already crossed two places off. Ribelle is Tim Maslow’s (of Strip-T’s fame) new restaurant on Beacon St. in Washington Sq. There is an open kitchen you can watch from the bar and a long communal table in the center of the room. My friend Leslie and I got a two-top along the wall. They offer an early bird special – “3 for $30” from 5-6:30pm. You have to know to ask for the special, which is an abridged version of the main menu. 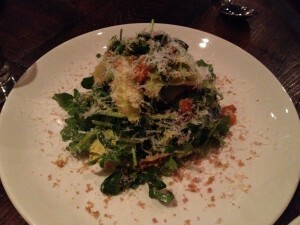 We started with a salad of escarole with small cubes of squash and boar. It was nicely dressed and I liked the bitterness of the greens. I have always used escarole in soups, but now I will try a raw application. 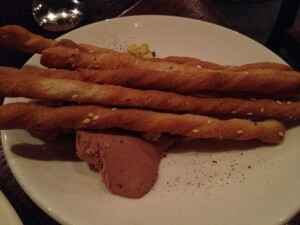 The duck liver mousse was silky smooth and topped with a small garnish of diced egg and something sweet (honey?). It was a generous portion, but the homemade breadsticks made no sense. How about some nice crostini, Tim? Something flat I can spread the mousse on? 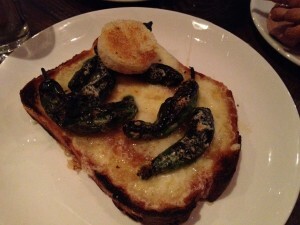 The truffle egg toast was a delicious grown up version of a toad-in-the-hole. A large thick slice of Pullman bread with an egg in the center, topped with melty fontina, roasted shishito peppers and a sprinkling of truffle salt. The peppers were not too spicy; they were smoky and flavorful and I loved the earthiness of the salt. 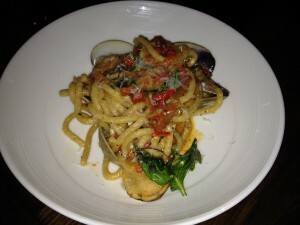 Bigoli was a long tubular homemade pasta, served with luscious and plump littleneck clams. It was a simple, flavorful dish. The portion was small. Fideos is a Spanish noodle dish. I’ve never had it before; I only remember that Padma raved about Ilan Hall’s version on a Top Chef final. 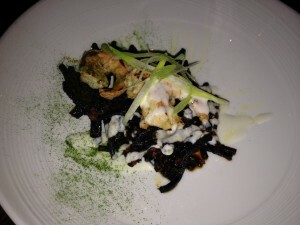 Ribelle’s version is made with squid ink and shrimp. It was crunchy and fun to eat. Like the bigoli, it was another small sized portion. 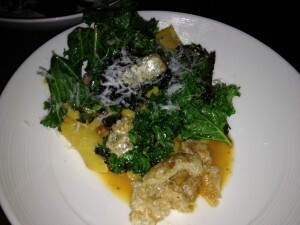 Our last dish was pappardelle with Bolognese, kale and garnished with chicharrones. The pasta needed 30 seconds longer in the water; I like my pasta al dente, but this was plain under-cooked. The sauce was rich and hearty, but did not have the rich tomato flavor I associated with Bolognese. The kale was a nice addition. The reviews all agree that dessert is a weak point, so we opted to go to Athan’s to the street for cake and tea. My citron cake (lemon) was dry. 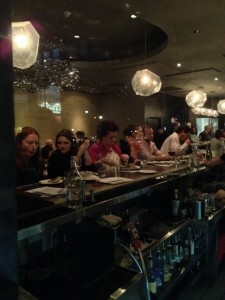 The service was super attentive – plates were whisked away and water refilled instantaneously. Leslie enjoyed her white wine ($12) and my cocktail was delicious ($9). Leslie noted that all the dishes "were really well seasoned," I agree, I think the food was interesting and thoughtful. The early bird special is a terrific way to sample Ribelle’s menu – get it while you can. On my way out, I noticed Boston super chef and restaurateur, Lydia Shire (Scampo, Towne, Locke-Ober, Biba), dining alone at the bar. She seemed to be enjoying her meal.